Do you remember your childhood toys? Wasn’t it bliss to play with them alone or with your friends and slip away into a special, ageless world of fantasy? Sydney artist and Archibald Prize finalist Nick Stathopoulos not only remembers his toys – he’s still got boxes and boxes of them. The toys are all in pristine condition and many are still in their original packaging. Stathopoulos still adores his toys. What’s more, he finds them so evocative and nostalgic that he has used them as the foundation for his exhibition. Stathopoulos was born in 1959 and grew up on a diet of 1960s television cartoons and action heroes. His interior world abounded with fictional characters like Captain Scarlet, Thunderbirds, Astro Boy and a space-age robot called Gigantor (“Bigger than Big, Taller than Tall!”) which was remote-controlled by a little boy called Jimmy Sparks. His Corgi toy of The Beatles’ Yellow Submarine (“with revolving periscopes and two automatically opening hatches revealing figures of The Beatles”) is a special favourite. Stathopoulos is still collecting. His plastic model of The Flintstones at the Drive-In is a newish purchase, and he is over the moon about his brand new Barbie doll, fashioned after actress Tippi Hedren in the Hitchcock classic, The Birds. Gorgeous and fetishistic in her black cardboard showcase, and complete with chic accessories, Tippi Barbie is being attacked by huge plastic birds. Mertim Gokalp is a Sydney based artist of Turkish origin who has been recently granted a distinguished talent visa by the Australian Government to allow him to live and work in Australia. He has moved to Sydney in 2009 and since then he has been working from his studio in Balmain. 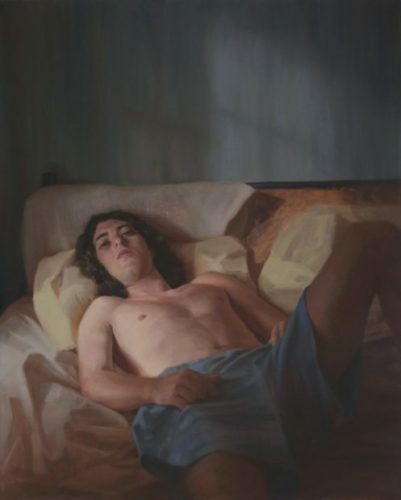 Mertim’s training at the Mimar Sinan Fine Arts Academy, Istanbul, has prepared him well for a career in portraiture, and in the five years that he has been living in Sydney he has been selected as a finalist in all the top portrait exhibition here: the Archibald Prize in 2013; the Doug Moran Portrait Prize in 2012; and the Black Swan Art Prize in 2011. In addition he has hung in other regional shows like the School of Visual Arts, New York, 2012 with an Honorable Mention; and the Sydney Hunters Hill Regional Art Prize, Winner in 2012; and Highly Commended in 2011. To me, painting is a synthesis of my feelings, inspirations, reactions and struggles; it is a way of breathing in and out…Painting portrait is one of my passions as it is a great area to explore the underpinnings of human psychology. Using the narrative potential of portrait painting, I aim to challenge the viewers and confront them with their most inner feelings. My portraits are not literal representations of people posing or sitting. These are subjective portraits of the psyche. All portraits reveal something about the subject, but they are open to many interpretations as they are enigmatic most of the time.My portraits are a celebration of the human form. Similarly, I aim to capture particular psychological moments of the places, and my landscape paintings are not literal depictions of places. Instead, the landscapes I paint reflect my subjective relationship with the places. As an artist trained in a Fine Arts Academy, I always appreciate and try to live up to the standards of great academic masters. The inspiration is to incorporate my observations into my unique style. Marie is a contemporary artist and lives and works in Sydney. She has been a finalist in the Doug Moran National Portrait Prize, the Black Swan Portrait Prize and the Portia Geach Memorial Award Amongst others. Her intention is to capture a sense of place and time – imparting a moment or feeling is equally important in a landscape, portrait or in life. Marie studied at the Julian Ashton Art School and has a Bachelor of Design in Visual Communication. Lucy West-Sooby is a self-described ‘art maniac’ who created her first illustrated novel, ‘The Life of Mrs. Quoll’, at the age of 9. Lucy gave up painting for 8 years following high school until finding a home at the Julian Ashton Art School in 2012, where she won the prestigious Brett Whiteley Scholarship in 2014. Michael Simms is a visual artist based in Sydney. After completing a psychology degree in Adelaide, his quest to understand people led him to the Sydney art world where he won a scholarship to study fine art at the Julian Ashton Art School. Michael is fascinated by the transient nature of existence, and the role portraiture plays in creating a vestige of someone – particularly in today’s world where we are surrounded by an unprecedented number of images of faces. His aim is to capture qualities in his sitters that may not be immediately apparent to everyone. In 2016, Michael was the winner of the Cambridge Studio Gallery Portrait Prize, and has been a finalist in several major awards including the Calleen Art Awards, the Percival Tucker Portrait Prize and the Contemporary Art Awards.